TWO O'CLOCK COURAGE has been one of my favorite "B" movies since I first saw it in 2010. I'm delighted that it was just released on DVD by the Warner Archive. 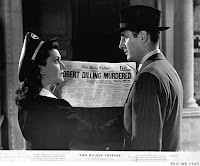 TWO O'CLOCK COURAGE was loosely based on a "B" film of nearly a decade earlier, TWO IN THE DARK (1936), which starred Walter Abel and Margot Grahame. The original inspiration for both films was a novel by Gelett Burgess. 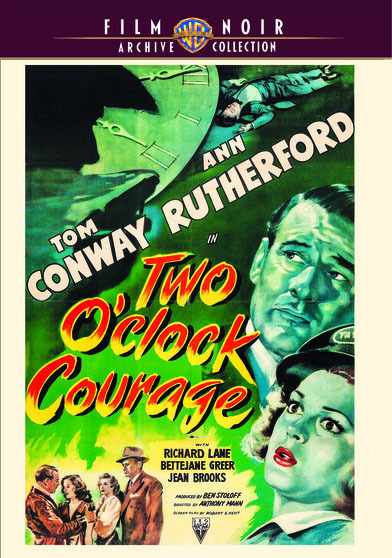 TWO O'CLOCK COURAGE was one of the earliest films directed by Anthony Mann. Although I just saw the movie a second time last year as part of a Mann tribute at UCLA, I was glad to revisit it once more thanks to the Warner Archive disc. In this fast-paced 68-minute film, Tom Conway (aka the Falcon) plays Ted Allison, who starts the film as an amnesiac. Ted has a "cute meet" with a taxicab driver named Patty (Ann Rutherford) when he stumbles in front of her cab. Patty is sympathetic toward the injured man and spends the evening helping Ted trace his lost identity -- and his possible connection to a murder! Patty doesn't believe Ted could possibly be a murderer and never gives up helping him dig for clues. The debonair Conway and the effervescent Rutherford make a very appealing team in a fun little mystery. The fine supporting cast adds to enjoyment of the film, including Jane Greer (billed Bettejane Greer), Jean Brooks, Richard Lane, and Emory Parnell. 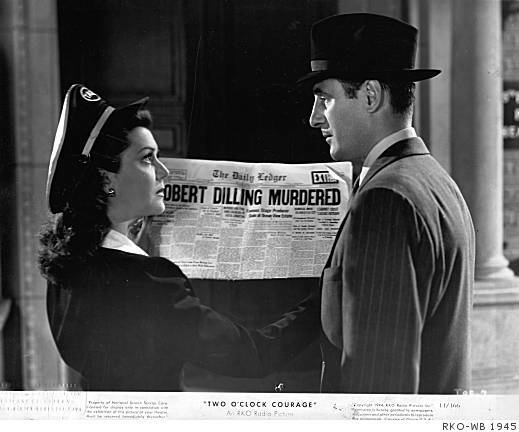 Watching this film again, I was struck by some similarities TWO O'CLOCK COURAGE and the original TWO IN THE DARK have with the recently seen PACIFIC BLACKOUT (1941) starring Robert Preston and Martha O'Driscoll. Preston and O'Driscoll meet in a park, just like the couple in TWO IN THE DARK, and she doesn't believe he could possibly be a murderer... The WWII era plot of PACIFIC BLACKOUT does diverge but they're all very enjoyable "couple on the run solving a mystery and falling in love" movies. 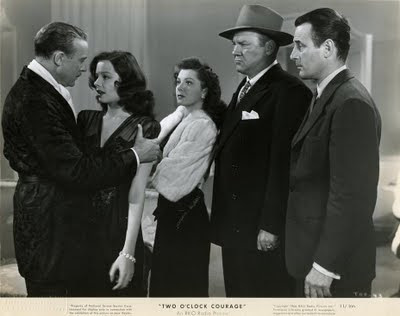 TWO O'CLOCK COURAGE was filmed in gleaming black and white by Jack MacKenzie. The first part of the film is a little more speckled, with bits of debris, than the typical Warner Archive DVD, but for the most part the disc looks fine, and it's certainly a completely watchable disc, with excellent sound. There are no extras. Recommended for my fellow "B" mystery fans! A neat little mystery with a noir premise and some atmospheric photography right at the beginning and again when Conway recall what actually happened. A good role for Conway, in my opinion. It has a similar feel to a Falcon movie. Hi Colin! I agree, it does feel rather like a FALCON movie, and what's better is he even gets the girl at the end. LOL. Conway's particularly engaging in this one. Hope more people will try it out and enjoy it! I've gotta get this one! Only saw it once but it is my kind of 'B' movie. Tom Conway was really quite an engaging actor and during his RKO contract made a bit of a splash. I believe booze was his undoing though fashions changed anyway and his kind of suave, urbane sort was on the way out of movies as the 50s dawned. I like him though increasingly. Hi Jerry! Like you I enjoy Conway's easy-going yet sophisticated charm. I definitely recommend picking up this DVD -- I can vouch for the fact this film holds up to repeat viewings, having seen it three times in just a few years' time! LOL. 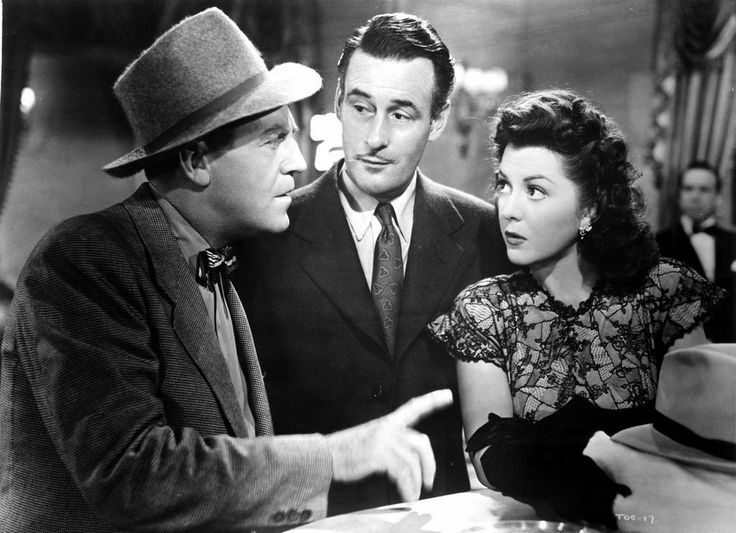 I like Tom Conway and will probably get this movie when the price is right, but was curious how much screen time Jane Greer gets. I know this is one of her earlier roles, so I'm not expecting much. Except for a few starring vehicles like "Out of the Past" and "The Big Steal", I'm always mystified why she wasn't the featured female instead of lesser (in my humble opinion) actresses. Jane doesn't get a great deal of screen time in this, two main scenes come to mind (I may be forgetting more). Jean Brooks has more time than Jane in a supporting role. Still, worth seeing the film not just for an early Jane (Bettejane!) role but for a host of other reasons.